Arkivum, a UK-based data storage startup, is offering its AaaS: Archive-as-a-Service. It's competing successfully with public cloud and large-scale on-premises tape libraries by offering escrow-based guaranteed storage in its cloud. It was started up in 2011 as a way of productising a service technology developed at the University of Southampton. This features data kept on tape in three remote locations, one of them under an Escrow arrangement, a service licensing agreement (SLA), a 25-year data integrity guarantee, and an on-premises appliance to take in large amounts of data and provide a local cache. The SLA for its Arkivum 100 service specifies data will be streamed back no later than 5 minutes after being requested. The appliance is provided as part of a managed service and has a drag-and-drop CIFS interface plus a REST API for application integration. The system uses LTFS to interpose a random-access file system interface to the tapes. Connectivity to its data centres is provided by the JANET academic network in the UK, N3 for the NHS, and commercial networks. 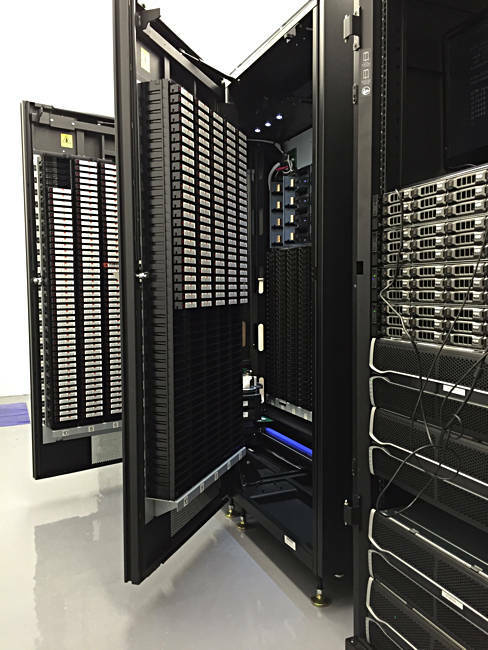 Arkivum runs a pair of separate data centres – using rented resources from commercial data centre suppliers – providing online tape storage, and there is a third, offline data centre run under the Escrow agreement. Incoming data is check-summed and encrypted by the appliance, and then sent to all three data centres with the Arkivum/100 service. An Arkivum/1+1 service provides 1 archive copy on tape in an Arkivum data centre and one copy in Escrow. The Escrow system is there to demonstrate no lock-in to Arkivum and the ability to get your data back should anything untoward happen. The tape systems are IBM libraries with LTO format tapes, tape being more cost-effective for long-term archiving than disk. The on-premises appliances are commodity (Dell PowerEdge) rack-mount servers with direct-attached storage, running Arkivum software. The LTO format is widely supported by tape drive and library suppliers. Arkivum will supply a fully managed on-premises archive – Arkivum/OnSite – if customers wish. It has had three rounds of venture capital funding; the amounts are private, and the repeat funding suggests a regular growth pattern. It's grown at 100-200 per cent from 2013 to 2014 and from 2014 to 2015. The customer base is mainly in the UK, with some international representation, such as the New York Museum of Modern Art (MOMA). MOMA uses Arkivum/OnSite in a 10-year project to store 6.2PB of digitised audio-visual data, some 35,000 items including 500 hours of 16mm Andy Warhol films. The local system involves an Arkivum/100 system (IBM LTO tape library) with its gateway appliance (multi-terabyte disk cache). This system is duplicated in a second, remote MOMA data centre for disaster recovery. A third, offline copy of the data is stored at a separate and third MOMA data centre, and so MOMA gets the 100 per cent data integrity guarantee. MOMA front-ends the Arkivum setup with Archivematica open source software and the open source Binder indexing system. Other customers include Aston, Loughborough and Salford universities, London's Tate Gallery, the Linnean Society of London, Bristol Genetics Lab, pharmaceutical company Phlexglobal of Japan, the UK's National Institute for Medical Research and the Oxford Molecular Diagnostics Centre. That's a presence in culture, life sciences and higher education. Arkivum's bosses think that its service has strong potential in mainland Europe and also in North America, based on its use thus far outside the UK. Taking advantage of that would require setting up an international business infrastructure and, we assume, more funding. Arkivum CEO Jim Cook and COO Andy Conway may well be thinking about this.